Worried the dessert desperados have their eyes on your favorite ice cream flavor? Hate to leave home for fear of cold-hearted pint-nappers? Tired of vain attempts to conceal your favorite passion behind the frozen peas? 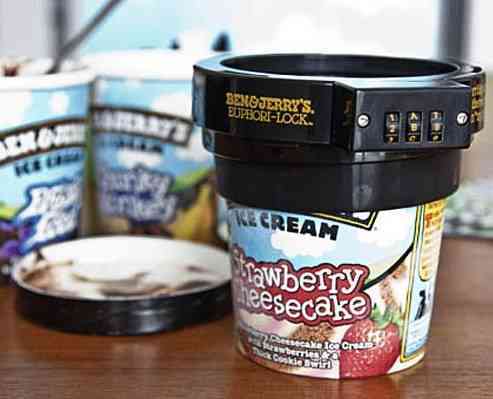 Ben & Jerry’s wants YOU to breathe easier! 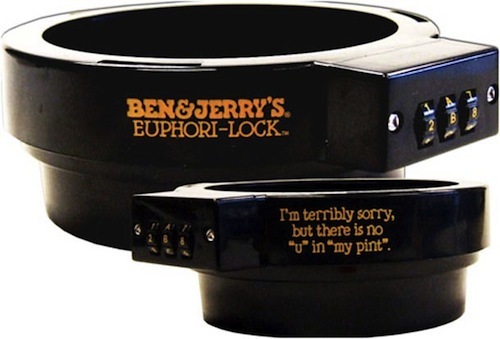 The Euphori-Lock is a tenacious two-part plastic security ring that slips around your pint’s upper lid for “udder” peace of mind. And not to worry – it comes complete with an easy-to-remember secret code when you’re ready to unlock your favorite treat!